Southern Illinois University Carbondale is committed to a robust, campus-wide recycling program to reduce our environmental impact. 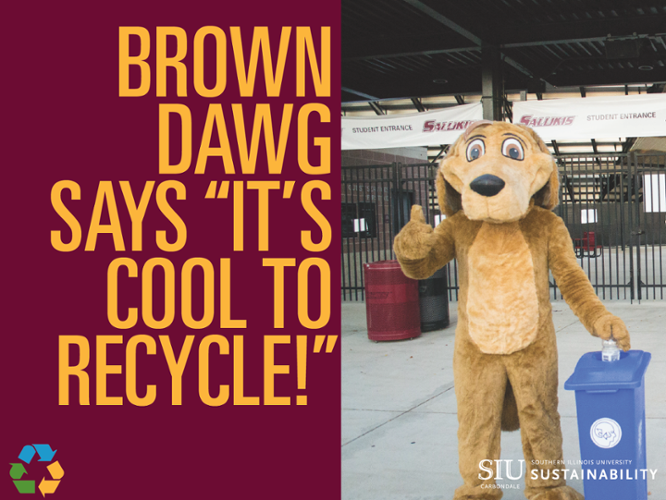 By creating a culture of sustainability, SIU hopes to foster in our students life-long habits of recycling and sustainability-minded action. Plastics 1-6 are now accepted in our mixed recycling bins (no Styrofoam) and empty pizza boxes can be placed with the corrugated cardboard recycling! 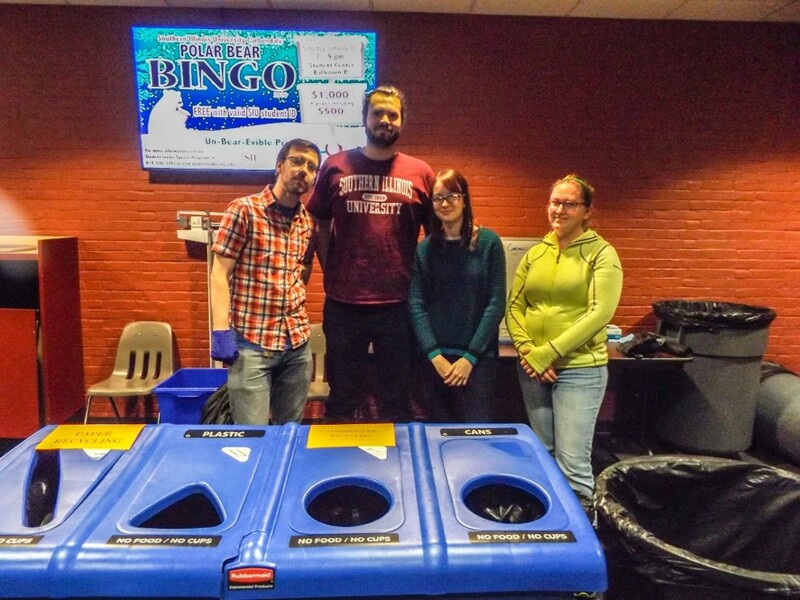 Each spring, SIU also participates in a friendly competition between universities called RecycleMania. 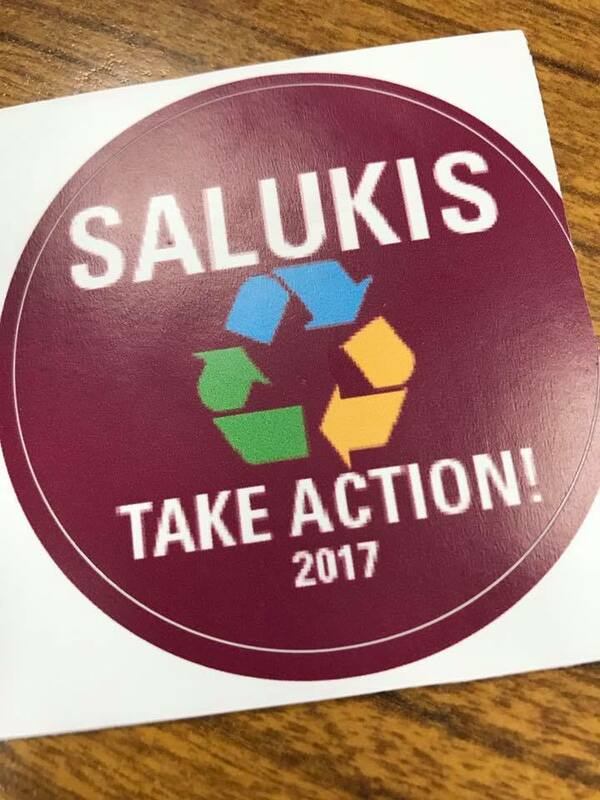 SIU Sustainability and fellow Salukis have continued to celebrate recycling at home football games!  Recycling bags have been passed out by student volunteers to parking lot tailgaters to increase recycling at game day events! 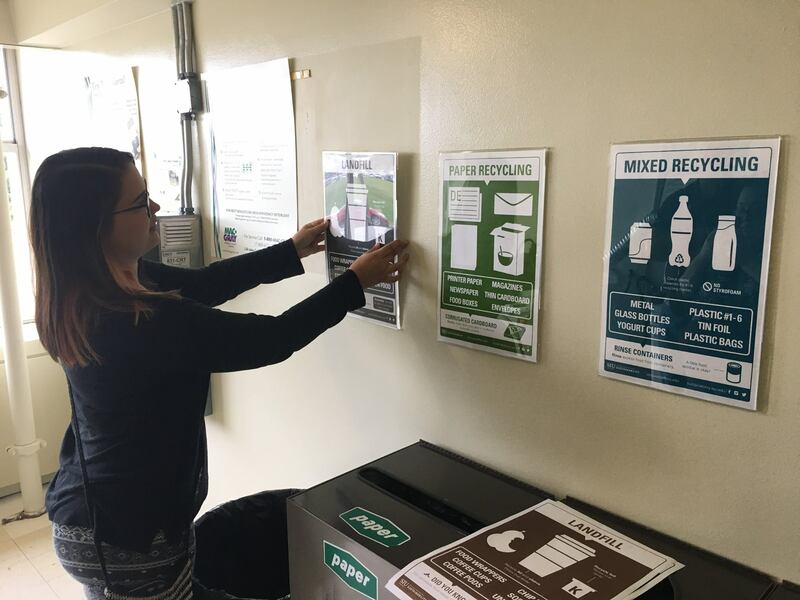  Patrons in Saluki Row received reminders of what can and cannot be recycled via our "Salukis Recycle" signage.  Brown Dawg and Grey Dawg reminded patrons to recycle through our new yard signs.  We continued to partner with the Grounds and Building Services crews to ensure processes are in place to recycle appropriately.  Patrons in the stadium were encouraged to recycle over the loudspeaker.  As a result, we have been consistently increasing our diversion rates at our ballgames. Congratulations, Salukis! A student design team from American Institute of Graphic Arts (AIGA) registered student organization has been working diligently with us to create a new informative and beautiful signage and labeling system for waste and recycling! The photos below show team members hanging the new signs in Schneider Hall, for testing before being rolled out more widely. Look out for their designs as they are rolled out more widely across campus! 6 student volunteers supported zero waste stations, educating participants about recycling and composting options! In addition, we offered some sustainability-themed games and completed a waste audit. Why a waste audit? 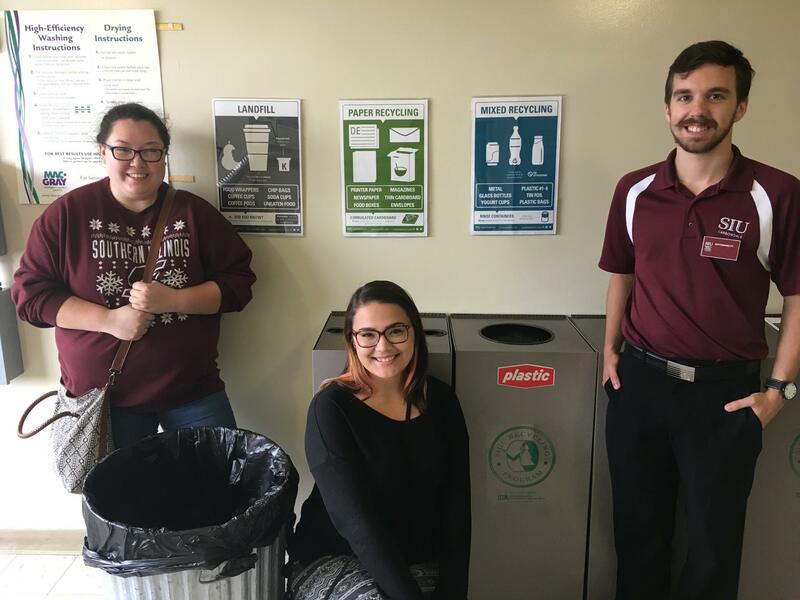 A waste audit can be performed to learn what kinds of waste SIU campus community members are creating, as well as how much waste we can divert from the landfill via recycling and composting. During a waste audit, we separate waste into recyclable, compostable, or landfill piles. These get weighed and recorded. This data is used to inform decision making and to encourage more responsible behavior! In addition to performing waste audits, we also have a new Zero Waste Program. For details, click HERE. SIU participates in America Recycles Day which falls on November 15th every year. This is a day to educate the students and community about what can and cannot be recycled in our community and realize the impact of recycling. This includes how and why we should include this habit in our daily routine! This year, (2016), the sustainability office tabled outside of the Student Center, giving out stickers and opening up a discussion about sustainability on our campus! 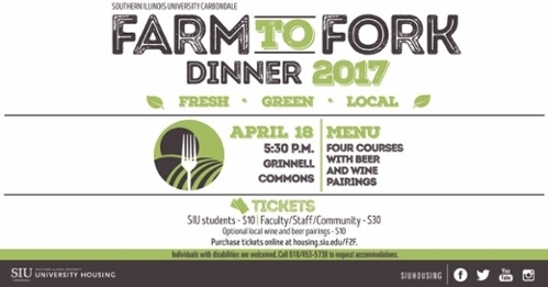 Farm to Fork is an annual dinner where participants enjoy locally grown food prepared by chefs at the University Housing Culinary and Nutrition Services. The event is held in partnership with with the SIU Sustainability Office, SIU Fermentation Science Institute on this event, and SIU Department of Animal Science, Food & Nutrition.